The Martin 15 Series D-15M acoustic guitar looks like it came right out of the history books, and delivers a sound for the ages. In its 175-year history, Martin has set more guitar design trends than can be counted. The company still embraces design techniques introduced many years ago to create their guitars' timeless tone. 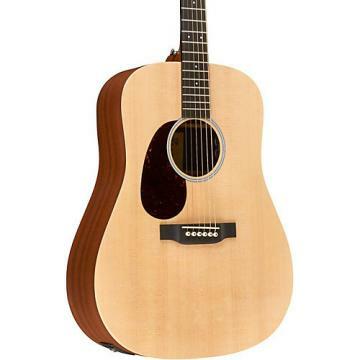 Built on a dreadnought platform, the Martin 15 Series D-15M guitar boasts 14 open frets for a unique design and great range of tone. The top, back, and sides are genuine solid mahogany, offering strong guitar tone, with crisp, clear subtleties in each note's definition. One of mahogany's finest qualities is its density. Although it's not the hardest tonewood, it is free of air pockets and other deformities. 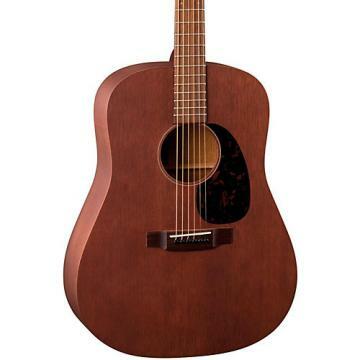 The vintage sound produced by the Martin 15 Series D-15M acoustic guitar is reminiscent of the Style 15 Martin guitars made popular during the 1940s. The Martin guitar is equipped with a mortise and tennon neck joint, offering the best wood binding practice ever conceived. Often used for shipbuilding, the process fuses two pieces of wood into a single, sturdy unit that stands up to the elements time and time again. The results are evident with the strength in tone and power in projection that you hear with each strum of this Martin acoustic guitar. 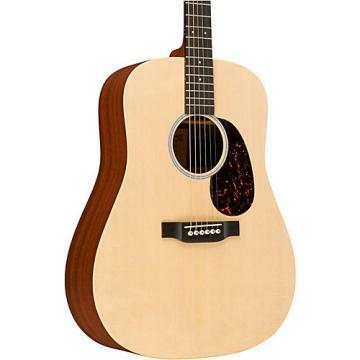 The Martin guitar's solid mahogany neck further complements the crisp, defined acoustic sound of this dreadnought. The bridge and fingerboard are solid East Indian rosewood, adding smooth sustain to the mix. The 14 open frets, 1-11/16 in. nut width, 2-1/8" bridge string spacing, and 16 in. radius add comfort for your intricate fingerboard movements. Other appointments include a single-ring rosette, bone nut, solid/square taper headstock, solid East Indian rosewood headplate, diamonds and square fingerboard inlay, belly-style bridge, nickel open-geared tuning machines with butterbean knobs, and a solid black ebony bridge and end pins. Dressed in a soft satin finish and featuring a Delmar tortoise color pickguard, the Martin D15M guitar glows with classic vintage looks and sound. Whether jamming with your buddies or playing for a crowd, Martin's natural acoustic sound stays true. 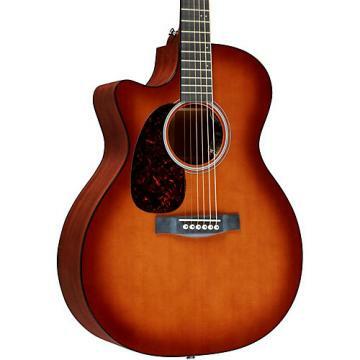 Own a D15M dreadnought guitar today! 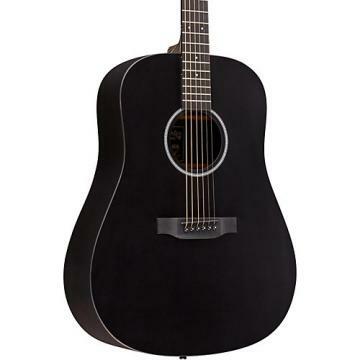 I am primarily an electric player and the low, easy to finger action on this Martin are very player friendly. Right out of the store it had low action with zero string buzz anywhere on the neck and excellent intonation. Overall this guitar is a fantastic value and the all mahogany body gives it both a unique look and sound with great projection and string to string balance. If you want every dollar to go into the guitar and don't care about flashy inlays, this is the guitar for you. This is a meat and potatoes guitar. I thought it was ugly when I first saw it but the salesman insisted I try it out. I was instantly hooked becaused it sounded better than Gibsons costing 3 times as much. The power and projection from the relatively small body is loud, accurate, and clear. It's good for fingerpicking as well as strumming. The look of the guitar has grown on me because it really stands out. The build quality is top notch. Plus, it smells like a ceder closet. Stripped down no frills Martin. It has an extremely high build quality. Hand made in the USA for this price? You bet. If you care about sound and not about a bunch of mother of pearl inlays, this guitar is a great value for the money. .I absolutely love this guitar. I've had it for about a year and a half. I own and have owned much more expensive guitars, but have never owned one that I enjoy more than the D-15M, and it's always the one I reach for first. The tone is just gorgeous, and the quality and appointments are excellent. Obviously the appointments are minimal, in order to keep the price point as low as possible, but there are nevertheless some excellent features on this model, including bone nut and saddle, open-gear tuning machines made by Gotoh (I have the same tuning machines on a custom 000-18, by request, and I think they are fantastic), ebony pins and an inlaid, though simple, rosette. Really a very beautiful guitar, in a minimalist way. And the tone just floors me every time. It's made me a real believer in all-mahogany guitars, and I've absolutely never loved a guitar more than this one. It would be the one I'd grab if I could only rescue one from a house fire. The guitar even SMELLS beautiful. If it were lost or stolen, I'd sell whatever I need to to buy another. And the website photos simply do not do justice to this guitar. One of the best models ever conceived by Martin, in my humble opinion, and an excellent value at the current price. .I am compelled..YES compelled to write a review on this masterpiece of an instrument. In all my years of playing I have never been awe struck or even taken back by the pure tone of this brown simple but beautiful looking Martin. I stumbled upon this guitar by accident as I visited my local guitar shop. The look of the guitar makes it stand out from the rest and when I picked it up off the rack something about it was different. Perhaps the light weight or the beautiful smell. The first strum was deep, mellow and crisp. A rich vibration that went straight through my body. You can feel the sustain almost surround you. A 'woody' sound is the best way I can describe it. Pure and lovely woody tone. You can tell it's built of only quality mahogany. My breath was taken away. As I tried different styles from taping to heavy and light strumming to finger picking, this chocolate Martin reached deep into my soul as it responded to everything I asked it to. As I left the shop I was haunted by it. I came back two days later and picked it up. It is now the guitar that I will proudly one day pass on to my son. It is a special instrument in every way. I can't praise Martin enough for the pure quality at a great price and I cannot recommend this tone machine enough. If you are even considering the D15m DO NOT hesitate. Do it and thank me later! .I've been playing classical, jazz, and fingerstyle guitar for almost 15 years. The fit, finish, and sound of this guitar is absolutely fantastic. Super rich lows, thick mids, and truly sparkling and harmonically unique highs. The guitar arrived from MF in excellent condition -- no need to adjust action at the saddle, or the neck upon arrival. Pulled it out, tuned it up, and it has completely blown me away. The D-15M is an extremely well-crafted American instrument that Martin will stand behind (as long as you're the original owner) for life. Not to mention, this thing is an olfactory delight -- smells like a humidor full of spices and chocolate. It really is an experience to play. .Wanted to get a HD-28 but due to financial constraints decided to get the D-15M; not disappointed getting it; love the deep base sound, love the "strip down" look, love the lightness and comfy feel of it. Enjoying my guitar and will keep playing it for years to come-will not sell it. A great Martin product-solid all around. .This is a Superior Guitar. Probably the lightest guitar on the market. The sound is unlike any other, and the quality is astounding, bone nut and bridge. Not much more to making this a true hot rod muscle guitar. I changed the ebony pins to boxwood, and may get some bone pins yet. I recommend the Martin 92/8 phosphor bronze medium. Medium gage are recommended and the 92/8s are bright at first, but the strings sound much better after breaking in. This guitar flows harmonics naturally, and you can feel the body vibrate when you play. I bought the D-1 custom, switched nut, bridge, and pins to bone and the D-15 is still far superior. Beauty, and aroma are nice, my friend saw it and said, "now that's a bad ride" and that's the truth. This is truly a piece that will be an heirloom. I definitely recommend. The case is super heavy, and the strap that keeps it from swinging open broke immediately. I'd suggest the gator dread case, and with Martin would use that case. Other than that it stands above any guitar I've seen/played.id give it six stars! .Nothing is perfect, but this guitar is close. It is what it is. It's not flashy or shiny. It is just a very honest sounding guitar. If you want a Martin, and you want something a little different, this is your instrument. This is a very basic guitar and aside from the pickguard and the headstock veneer there is no more on this guitar than what is required to play. I wish the body was bound, but I am very carefull with my instruments and I doubt I will have any problems. The workmanship of this guitar is excellent. Everything fits perfectly and is finished perfectly. I am concerned about the number of "Special" Martins advertised on MF that are not of the highest quality materials or finishes. 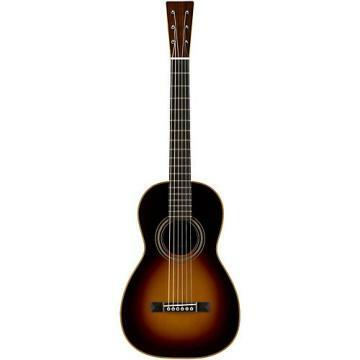 This, in my opinion is the least costly full quality Martin. The price is very good and MF ships for free. The quality and workmanship of the instrument is a very good value and the value of a good quality martin will remain for years in the future. .I always dreamed of owning a Martin and it took me a while to settle on this one. It has a snappy, warm tone, that doesn't overwhelm you with chinky bright string noise. Nice tight bass makes it great for fingerstyle. Much prefer the sound to a standard solid sitka spruce tone. You can't go wrong here! .I was always a rosewood man before I recently got this jewel. I never thought I would have a mahogany sided dred and certainly not the top too. This guitar is a cannon ! Strum an open E chord and you can feel the bass in your chest. Even though it is "plainly" appointed, you get nice fingerboard inlays. I challenge you to find a more powerful sounding guitar in this price range or even higher.